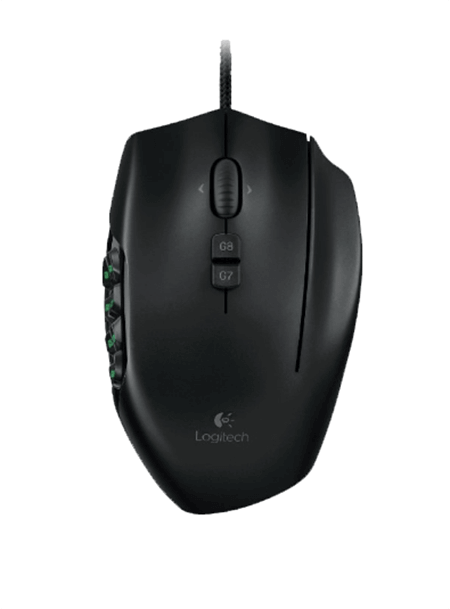 The Logitech G600 MMO gaming mouse is designed specifically for massive multiplayer online games like World of Warcraft, Star Wars: the Old Republic and others. At least, those were the games I tried the mouse with and I have had no problem with it whatsoever. According to Logitech, they collaborated with MMO game developers as well as gamers to make sure the G600 helps its users play better. I believe that’s the reason why it has all these perfections in it. 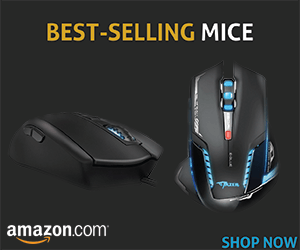 This mouse is highly customizable and easy-to-use, giving you complete control to play your favorite MMOs. It has 20 buttons on easy reach for quick and no looking navigation, resulting in faster gameplay. It comes with three primary buttons and a specifically designed 12 G-key thumb panel that gives you immediate access to 12 MMO skills. The 12 G-key panel is arranged in two sets of 6 that guide you to the right commands. In either of the two default MMO profiles, you can activate the G – Shift function with your ring finger button to double the functionality of any other button. Logitech claims that all the buttons are tuned to reduce click fatigue and avoid accidental misclicks. But honestly speaking, I always click the wrong buttons accidentally, no matter how much I customize them. Maybe it needs more time to get used to it, or maybe it’s just not as properly “tuned” as they say it is. My personal experience with this mouse is that I only recommend it for the palm grippers because my thumb controls 12 of its 20 buttons when I palm grip it. It becomes very hard for you to use the mouse if, like me, you’re used to claw gripping the mouse. The Logitech G600 MMO gaming mouse is also sculpted to support your hands to ensure that you have a great claw grip, comfortably with your favorite MMO while allowing you the customization you need to get the upper hand when playing PVP. And, with 3 different onboard profiles, 2 MMOs and one for General gaming, you can set up for optimal MMO use right of the box and no drivers. As with all Logitech G-series products, the keys are fully programmable using the Logitech gaming software. So you can create a command and store them in the mouse’s on-board memory and access them with just one touch. You can even store tracking and lighting color settings. The thumb panel’s RGB illumination is fully customizable with more than 16 million possible combinations that you can assign to different profiles to pulse on and off, cycle continuously, or just turn off with a high-precision 8200 DPI laser sensor. Unlike the Razer Naga, it has the Avago Optical ADNS S3095 sensor, which in my opinion just works perfectly on this mouse, making it the best MMO gaming mouse in my opinion, not only because of the sensor. The primary buttons reach up to 20 million clicks each. It also features a braided USB cable and one millisecond USB report rate. 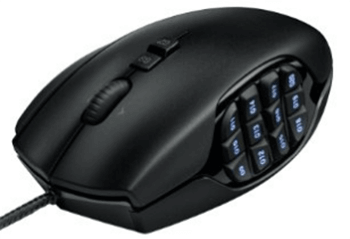 In conclusion, I will say that this is the MMO mouse that gets the job done in any game you play. I have used the G600 mouse with Windows Vista, Windows 7 and Windows 8. I am not sure if it will work with Windows 10 because I haven’t tried it yet.